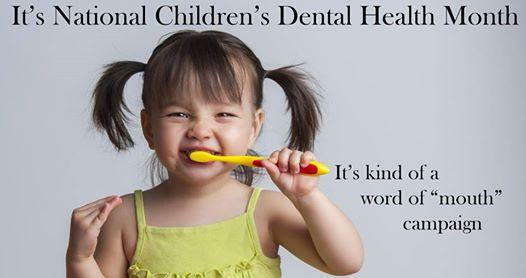 February is Children’s Dental Health Month and we want to celebrate! To our AMAZING established patients who currently see Dr. Whitson, we would love to invite your kids to join our Concord Dental Group family! And, as a thank you for scheduling a new “under 18” patient, you will receive a Kid’s Electric Toothbrush Kit! You just need to call during the month of February to set up their appointment, and you’ll receive your kit after their first appointment! Don’t have kids or they already come here? Refer a different “Under 18” patient and you’ll get the kit as a thank you for referring them! Just make sure they mention your name! We are hoping to encourage the benefits of full family dentistry! Dr. Whitson sees patients from ages 2 to 102! Your kids will be able to establish a relationship with Dr. Whitson and our team from an early age. One of the biggest benefits of family dentistry is your children following your example! Most kids who go to pediatric dentists don’t get the chance to see you getting your teeth cleaned. Seeing you come regularly shows them that oral health is a priority for you and teaches them it should be for them as well. By visiting a family dentist, the whole family can have their teeth cleaned together! Instead of scheduling everyone at different places on different days, the whole family can conveniently come to the same dentist at the same time! Please let us know if you have any questions and we look forward to meeting the next generation of the CDG family!